Nice One Doc :) !! 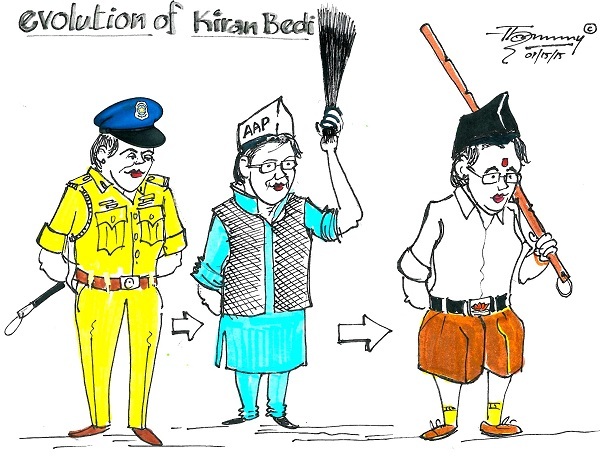 It is not unusual that Kiran Bedi with her mindset joins BJP. It is good for her, good for BJP and for the country. That is why right thinking people are joining BJP at this stage It is the need of the country. Great work, but as Mr. Dinesh pointed out, she did''nt joined AAP. I think you should have written '' MAIN HU ANNA '' on the cap. Kiran Bedi did not join AAP. After taking retirement from IPS, she was with media for sometime. Later, she was part of Anti corruption movement lead by Anna Hazare. But when Kejariwal break away from the camp of anti corruption movement, Kiran Bedi remained with Anna and did not join Kejariwal''s AAP party. Only now, she is in politics as she joined BJP yesterday.